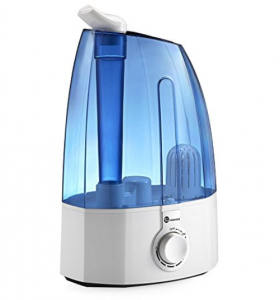 This is a good humidifier. Large capacity, and doesn’t use a wick system which you either have to replace constantly or they go moldy before you get a chance to buy more. Easy maintenance, really none at all if you have decent tap water. Most I’ve ever done was a quick soap and water rinse. Benefits to sleep are pretty noticeable year round, but during winter months I don’t know how anyone could go without one. Added bonus is the perfect low hum which won’t keep you awake – but perfect for those people that like a little white noise to fall asleep.